Recommendation: The best reference yet on the subject of modern Australian armour. Strongly recommended to all fans of Aussie military vehicles, or those with an interest in modern vehicles in general. The Australian Army is organised into three Battlegroups. Battlegroup "Leopard" is based on Australia's sole tank unit, the 1st Armoured Regiment, which operates the Leopard AS1. Exercise "Northern Predator" was the first full Regimental field exercise held outside of its traditional home at Pukapunyal in Victoria since re-equipping with the Leopard in 1977. It took the entire Battlegroup "Leopard", plus supporting elements from other units, to the heat and fine red dust of Northern Australia in 1995. This exercise, along with the permanent relocation of a number of Army and Air Force units, reinforces the emphasis on the defence of northern Australia under the APIN (Army Presence in the North) program. "Battlegroup Leopard" is an all-colour, pictorial overview of this enormous exercise. Mike Cecil is an Australian researcher and writer who has already published five books and many articles in local and international magazines. His series of Australian Military Equipment Profiles have provided detailed coverage on otherwise neglected areas of Australia's military heritage including Australian pattern armoured cars, carriers, field artillery and the early use of the M113. The new book is 65 pages in A4 format and printed on high quality, matt paper. It contains over 180 full colour photos of "Northern Predator", with one to three pictures to a page on average. The introductory text is only one page long, but detailed captions provide plenty of information along the way. There are abundant photos of the AS1 Leopard family, including rare pictures of the MTMC Mine Clearing version, and a great series of the ARVM Armoured Recovery variant in action. A good range of colours and markings are displayed too - from overall olive drab, to the standard three colour scheme, and even field applied mud as disruptive camouflage. The exercise included a wide range of other vehicles from supporting units. There is good photo coverage of these vehicles, including just about every variant of the M113 in Australian service, M548s, M577s, Land Rovers, Unimogs, Mack Trucks, Bulldozers - even Field Kitchens and portable shower units! There are also pictures of Australia's new ASLAVs (and old M113 MRVs) attached to Battlegroup "Eagle". Photo composition and quality is excellent. The attractive setting of Northern Australia is an added bonus. 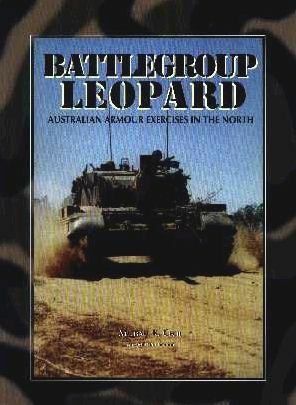 This is certainly the best reference currently available on modern Australian armour and supporting vehicles in action. There is massive potential for modellers of modern vehicles. If your local military bookshop does not stock this title, it may be purchased direct from the AMEP website. The book is available for A$29.50 (approx. US$18) plus A$2.50 for postage within Australia or A$5.00 for international delivery. Thanks to Mike Cecil for the review copy. Also Visit Track-Link for the best of Armour Modelling. Page Created 29 September, 1998.